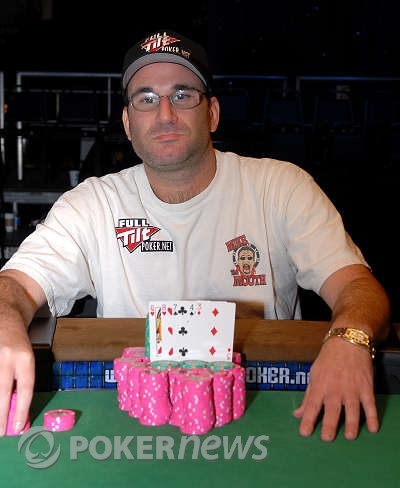 Mike Matusow is the champion of Event #18. This makes his third WSOP gold bracelet. "I want to thank all of my fans," said Matusow, as he was being interviewed by WSOP Commissioner Jeffrey Pollack. Matusow was clearly overwhelmed with emotion, though not quite to the point of tears. "I don't know much about this game," joked Matusow, "but I know no-limit. If I continue to play like I played this week, it's gonna be a real good World Series." That comment drew a rousing round of applause from all of the fans who stayed into the late hours of the night to watch Matusow's triumph. On the last hand before dinner, Matusow lost a huge chunk of his stack to Lisandro after betting a pair and getting called by Lisandro's ace-high. He came back from the dinner break with about ten big blinds in his stack. Just before play resumed after dinner, Matusow came over to our media table and started talking about the tournament. "It ain't over," he told us. He got that right. Mike Matusow had the button and open-shoved all in. Jeff Lisandro made the call and announced he was drawing one. Matusow went into the tank and it was very clear that he couldn't decide whether or not to break his hand. Finally, he said, "I'm good." 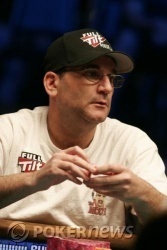 "It was a tough decision for me," said Matusow as he anxiously watched Lisandro squeeze out his card. Lisandro squeezed... a queen to make a Q-9. He is eliminated in second place and collects $347,004. The rally cap couldn't bring the gold bracelet for Lisandro. 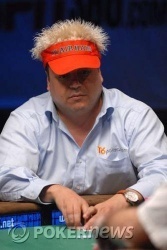 During the period of action that saw Matusow winning hand after hand, one of Lisandro's friends brought him a hat for good luck. Lisandro quickly put it on and hasn't removed it since. They say a picture is worth a thousand words, so just look to the right. The best players in the game aren't just seated at the table. Several well known pros are currently seated in the Milwaukee's Best No Limit Lounge Area. Those currently watching the action include Phil Hellmuth, Greg Mueller, Perry Friedman, Dario Minieri, Cyndy Violette, Jean-Robert Bellande, Shannon Elizabeth, Kenny Tran, and Johnny Chan. Not too long ago Phil Hellmuth, who is for some reason dressed like a five-star general, stood up to stretch his legs and Perry Friedman quipped, "Who called security?" 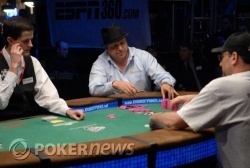 Every time Jeff Lisandro climbs up through blind steals, Mike Matusow knocks him back down. In the latest hand, Matusow raised to 225,000 from the button. Lisandro called. On the draw, Lisandro took one card while Matusow took two. Lisandro then bet 175,000. Matusow thought about it for fifteen seconds before making the call. "Pair," said Lisandro. Matusow slammed over K-8-6-5-4 to take the pot. In the first hand to see a draw in awhile, Mike Matusow raised to 200,000 on the button and Lisandro made the call. Both players drew two cards. Lisandro was first to act and he checked. Matusow, the most focused he's been all night, counted out 250,000 and pushed it forward. Lisandro tossed his hand in and Matusow stacked the pot. For the last few hands, the big blind has been getting a walk. It seems Lisandro's stack is at that "all in or fold" place, while at the same time Matusow doesn't want to enter the pot with a marginal holding and risk doubling Lisandro up. Just a moment ago between hands, one of Matusow's supporters shouted out, "Go Mikey!" Matusow peered in his general direction and began to sing, "Good things come...to those who wait."